Lucy Goes to Alaska (9 Feb. 1959)The Ricardos and Mertzes head to Alaksa, but arrive a day early and their room is not ready; it is occupied by none other than Red Skeleton, who generously shares his room with the foursome. Later, Ricky and Fred learn that they own land that is all ice and are constantly at each other's throats. Ricky and Fred's bickering causes Lucy to ask Red if he will buy the property, but chaos ensues. In the second half, the non-Native Iron Eyes Cody guest-stars as an Eskimo. He's accompanied by another Eskimo, played by Charles Stevens, who actually looks Asian. At this point in the story, Lucy and Red Skelton are lost in an Alaskan snowstorm after crashing their jeep. Dressed in the usual parkas, the Eskimos appear out of nowhere. Talking loudly as if the Eskimos don't understand English, Lucy asks if they have a dog sled. In perfect English, Iron Eyes answers that they have a plane nearby. Iron Eyes agrees to fly them back to civilization--for a price. He's piloting when Lucy cranks the wrong lever and sends the plane into a dive. 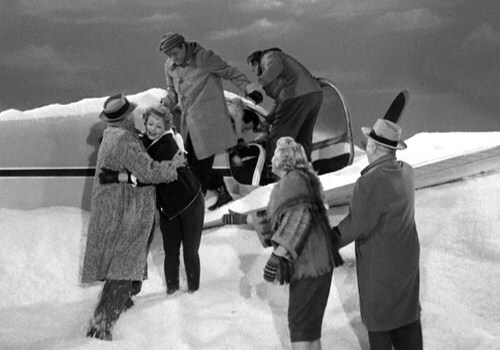 He hits his head on the steering wheel and is knocked unconscious, forcing Skelton and Lucy to land the plane. The only wrong note comes when they help him out of the plane. Dazed, he asks, "Who flew [the] plane?" That is, he drops the article "the" in a bit of Tonto talk. Other than that, it's a fine portrayal--if you ignore the Italian playing an Eskimo. The Alaskan Native is more competent at surviving in the wilderness and more superior at using technology. He's even a better negotiator; he gets a valuable piece of land for rescuing the others. For more on the subject, see Caribbean Cannibal in I Love Lucy. Below: The station master helps Iron Eyes Cody the "Eskimo," barely visible inside the plane.